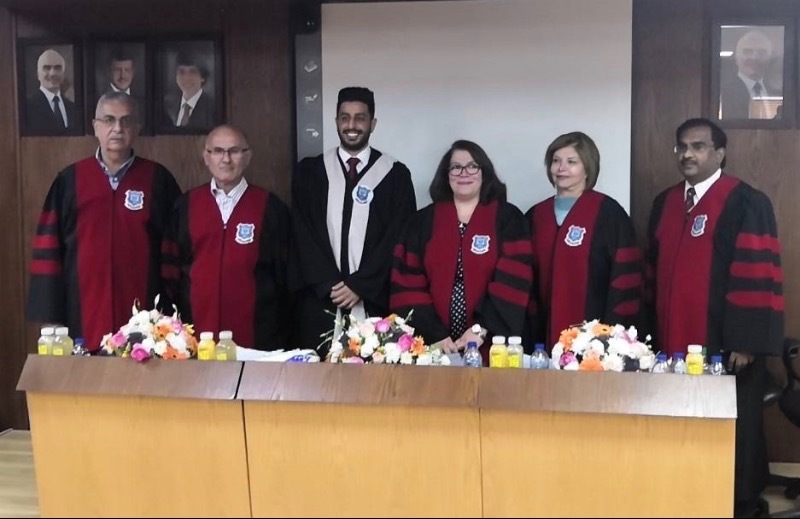 Abdulmannan Mohammad Abdulwahhab, a student Faculty of Faculty of Pharmacy and Medical Sciences at AAU, has defended his thesis titled “GC-MS Analysis and Biological Activity of Fatty Acid Obtained from Rhus coriaria L. Grown Widely in Jordan”. The thesis committee comprises the supervisor, Professor Ashok Shakya and Professor Nu’man Nofal, a co-supervisor in addition to Dr. Mayada Shihade, Dr, Nidal Al-Douri and Dr. Ghaleb Oreiqat. The committee has approved the thesis and recommended awarding the student MA degree in Pharmaceutical Sciences.